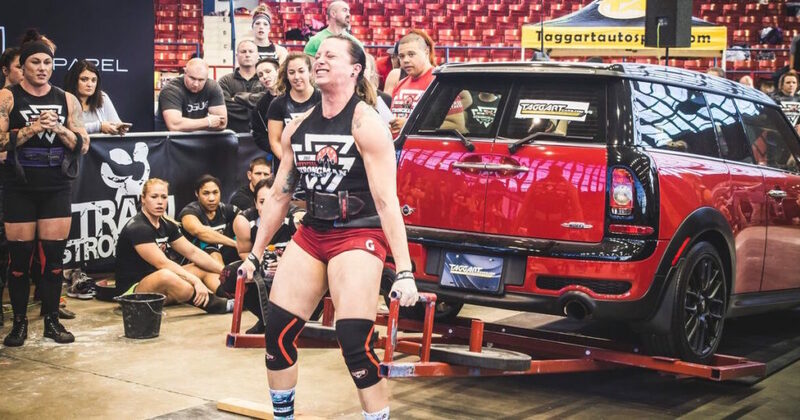 How frequently should you train strongman-specific events for maximum performance? Athletes who are looking for an edge often wonder if they can increase the frequency of training with the implements. There is no blanket answer for this question, but instead consider these concepts when setting up the long term training plan. Certain Strongman movements are very similar to those movements you would already perform in the gym. These lifts can be substituted for regular bar movements without much thought as to how they will affect recovery, joint damage, or central nervous system (over) stimulation. A quick examination of these lifts would reveal that things like log, axle, and side handle deadlifts can be easily substituted for bar versions of the exercise. You may need to make a few considerations when training them due to the different set up (especially when pressing from a rack) but often, getting used to the unique positions of the grip can help you in the long term. The next group of events can cause some physical damage to the skin and place more stress on the joints and tendons. When training tire flips, stones, Conan’s wheel, and yoke, one must address how training these events for more than a few weeks’ cycle can start to grind the body down and begin to hamper progress. If you train these events during the week it is better to keep them lighter and sharpen your technique. The last set of movements to consider are the rare ones that are not often seen in contests and should be reserved for when you are challenged to test them specifically. Consider The Hercules hold an event that requires a specific set up and can damage the palms of the hands if trained to failure. Specifically working the grip is often better than training the event itself. Fingal’s fingers are dangerous if training alone and even when you use a spotter, the risk of head trauma is present. Consider the rarity of an event, how dangerous it is and how to train around it. At the risk of sounding repetitive, I believe that conditioning is a key element for true success in Strongman. Pushing your car, dragging the sled or carrying a sandbag should be the base of your interval conditioning programing and that programing should be implemented year round! You can add or drop volume or weight for intensity but there is little reason to drop cardiovascular training completely at any point in the season. If you are working purely on strength, gaining mass, or have no contest plans you should still refine that strength and make certain you have the capacity to complete the training without feeling like you are going to gas out. Learn to love these events and enjoy them throughout the week. In a rush to work with new shiny toys (the implements themselves) people may neglect some of the basics of training. They are called odd objects for a reason. Lack of handles (stones), thickness (axle), and width (log) can exaggerate flaws in weak technique. Bars and dumbbells are smaller and easier to keep under control and should be your primary tool for learning how to lift and build a base for your training. Developing excellent technique on the the over head press, for example, will develop proper paths of motion for the body. This increases your long term capacity for strength and limits the risks of injury due to improper mechanics. In my opinion if you master the barbell prior to incorporating the events you will have more success in the long term. In every aspect of life one must find balance. Overtraining the events can take a toll on your system but under-training them can wreck your score sheet. When you decide to incorporate some events during the week, (and not just group training days) do so slowly by just adding one or two at a time. If you seem to be finding success then you may want to add more, or swap out the ones you are doing. As always keep your training intense, find pleasure in it and make forward progress!